Looking forward to the Kodosai this coming October. We then have the end of year course coming up in December and plans are already underway for a very large combined course/conference for the Spring of 2018. This will be a very large gathering with senior grades (5th – 10th dan) in various martial arts in attendance. Keep this in mind because it is definitely one not to be missed!! There will also be a special course in military close combat for suitably qualified yamabushi/shugenja that will be taking place in September. Stay tuned for more details. 100 Days to Kodosai traditional martial arts course!! Kodosai. Traditional japanese martial arts and culture. It is now 100 days until this event. There are over twenty master-teachers of the martial arts that will be instructing. (two full days 9 – 5!) It is the largest course of its kind and is always well attended. Yamabushi/Shugenja you need to book your place NOW! Please see below for more information. Really good course in Bristol with all instructors doing themselves proud and all who participated enjoying themselves. A more detailed report with pictures to follow soon! Please click on the link below (or copy and paste into your browser) for more details on the instructors who will be teaching on this course. It is said that a drowning person sees their whole life flash before them in a matter of a few seconds. This would seem to have some basis in fact as it is believed by neuroscientists that this happens as part of our basic survival instinct. It is the brain desperately accessing all of its data-base for anything and everything which might help us continue living. In those (potentially) last few seconds the human mind is remembering. Memory, then, is important not only in the retrospective sense but also in the prospective sense. whatever we have done in the past, the emotions we have experienced, the mistakes we have made and the successes we have realised, all congregate together in our head to help us in our present and drive us forward into our future. Memories help us develop the faculties of thinking, imagination, creativity and reason. If we teach good lessons and our students remember good things then we are all helping to contribute to a much better and brighter future which we can all share and enjoy together. Our dojo, and what is taught in them, should always provide people with strong, happy and positive memories they can call upon throughout the course of their lives. Memories that will sustain and support them whenever life becomes a little more difficult than usual and help them find strength whenever they need it and to smile even when they are sad. Our memories are literally a treasure chest filled with not only post cards from the past, but useful tools for the future. Special accelerated and intensive instructors technical courses now available in brown/black belts in any style or system in the following martial arts. Become qualified in any/all of the above. Improve your skill-set and open a section teaching these martial arts at your own club! Contact us for more information now! I don’t normally do reviews but as I was so pleased with the service I received from Barrington swords I thought I should share it. A very good friend of mine recently gave me a Katana as a gift even though this held massive sentimental value to him. The Katana was part of his sons memorial piece and I felt very honoured that he would pass me such a gift. 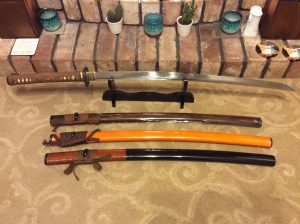 He explained that when he had received it from Japan, the sword had suffered quite a bit of damage, but due to his own ill health could not return the katana to the supplier. The damaged was mainly on the Saya where it had split quite badly both top and bottom. He had attempted to repair the sword himself but it could never be used due to the risk of injury. I did a bit of research and contacted the supplier who explained that they could make me a new Saya, but I would need to return the sword back to them. I was told as they were all hand forged the chances of buying an off the shelf replacement would be very unlikely. Obviously the cost of returning the sword would be expensive, so I started to contact suppliers in the UK. 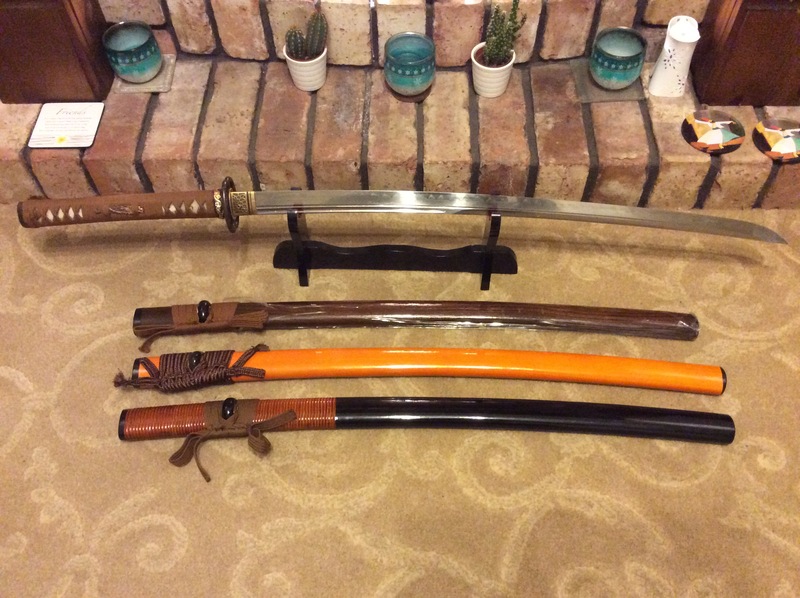 I was told about Barrington swords by Gareth Waite Renshi who had used these before, so thought I would contact them. After doing a bit of research I phoned them and spoke with a gentleman called David. He couldn’t have been more helpful! I explained about the history of the sword and why I had it. I was told that they had a selection of Saya available but obviously it would be hard to guarantee a good fit without the Katana to try in them. David suggested I send the Katana to him, this way he could try the Katana. I packed the sword and posted it the following Friday for a Monday delivery. I was hoping to hear something by the middle of the following week, so you can imagine my surprise when I received a phone call on Monday morning at 9.30 from David explaining that he had received the sword and found a Saya that fit perfectly in an ‘old gold’ colour that would match the original Tsuka that was brown and Gold. I was over the moon to say the least. After a good chat he then went on to inform me that he had also included a second Saya free of charge! The second saya was black with brown rattan wrap, again matching perfectly. He had this one on a display stand but it was never sold and as the Katana fit so well he was giving it to me as a gift. I offered several times to pay but he wouldn’t take anything for it! David packed the swords up and I received them the following day. Not only was I given great service but David also offered lots of advice on Tamishigiri, folding the tatami mats ready for cutting and how to build my own stand for the tamishigiri. I was also invited to go to his dojo to try cutting. Unfortunately due to where they are based this isn’t an option at the moment but this is something I would like to do. bottom: black with brown rattan wrap. I would just like to say a massive thank you to David and Barrington Swords.